Use Verblio (formerly BlogMutt) in a blog post. That said, some people tell their moms they write their own blog, and we totally understand how that wouldn’t be the easiest thing to explain over Thanksgiving dinner. The fact of the matter still is, though, that blogging is crucially important and no matter how you slice it, that writing takes a damn large chunk of time. Time that businesses and agencies increasingly just cannot feasibly sacrifice. Knowing all this, the only thing better than finding a Verblio customer willing to partner with us on a customer spotlight is a customer volunteering to serve as a future case study. Kevin Kerner of the new marketing agency Mighty & True did just that. And a marketing agency customer at that? We struck gold! While we at Verblio pride ourselves on being the best content writing service for agencies, and up until this point, for the vast majority of our agency customers, we’re the behind-the-scenes partner who helps fulfill their clients’ content needs. Which we’re always happy to do. 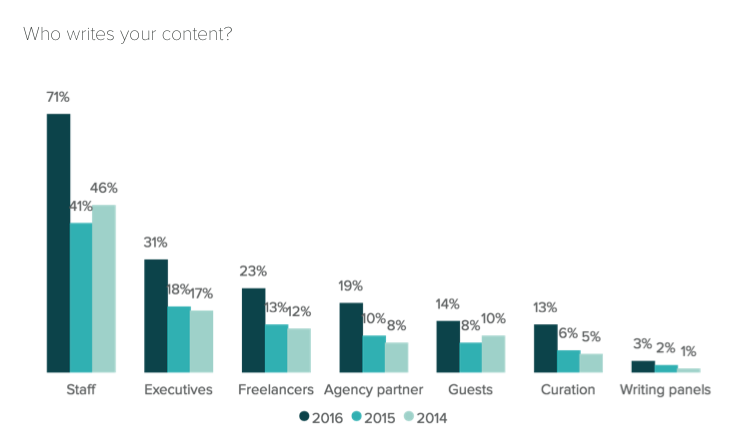 But in focusing on their clients’ needs first, it’s all too common for agencies to neglect their own blogging and content development efforts. Agencies continue to ignore content, and really quality content at that. And in focusing his agency on content specifically to generate business and get in front of potential clients, he’s getting the leg up. In the lifespan of Verblio customers, Kevin’s relatively new around Verblio—he’ll be rounding up on his first three months at the end of April. And even as green a customer as he is, turns out, he already knows we’re exactly the solution his agency needs to stir up conversations with leads and ignite industry discussions that turn into longer-term relationships. We use a blog post as a direct outreach opportunity by email, he says. Since we primarily know the people we’re reaching out to—I have plenty of industry contacts and friends I’ve gotten to know over the years—the copywriting is the feeder in the form of email newsletters. In sharing these technical, opinionated posts, we reinforce proactively that we’re doing cutting edge, innovative work with technical brands and UX, experience-based design. I have a ton of friends in [the industry], so I know what interests them and it’s kind of a polite way to reach out and pitch a discussion or start a conversation. So it obviously helps feed his agency’s client book AND keeps his agency pals all sharp and abridged of developments in the industry? Methinks he might be building some long-term solid content karma. So what specifically about Verblio is really clicking for Mighty & True? The first posts Mighty & True received from Verblio impressed him. The quality was there immediately. And since then, he’s compiled quite a list of specifics on why Verblio is working well for his agency and process of content development. Check ’em out. 1. Quality is evident; writers complete research AND infuse opinions. One post in particular called “Sketch vs. Adobe XD” really blew him away and struck him as “awesome.” What was so great about it? It demonstrated research on platforms, asserted an opinion on who wins, and required a specific competency in UX. Another post called “Art & Science of Design” similarly floored him. It explored new practices and processes in the industry, instructed how to do them, and fit nicely in the technical, opinion/comparison pieces that Kevin and the whole Mighty & True team can really use. 2. Writers easily tap into the agency’s voice. “All our posts are in line with our tone,” Kevin says. The key? The keeper of the Mighty & True brand voice, their copywriter, “owns” Verblio for the agency so voice and preferences are easily conveyed in their briefs. 3. It’s very easy to use without talking to writers. Apart from the content itself, Kevin touts Verblio’s platform as particularly effective in intuitively prompting for topic ideas, teeing up actions to take on a post (accept/edit/decline), and conscientiously streamlining communication with writers. For these reasons, he has found in Verblio a worthy, capable partner in helping scale his content without the usual, frustrating hiccups present in other platforms or in working with freelance writers directly. 4. Can’t beat how cost-effective Verblio is. 🙂 This one speaks for itself. Thanks again to Kevin for volunteering to serve as our April’s customer spotlight and for taking the time to talk to us more about how Verblio is working for him and into his internal content development process. We are thrilled to spotlight him and even happier still to be his proud content writing partner. Ready to get started figuring out how you can replicate Mighty & True’s success with content? Fill out the form below and let’s talk strategy.